In order to gain access to the sensor, you need to remove the starter. This actually isn't that hard as there are only 2 big bolts and 2 wires to remove. First disconnect the negative power wire from battery. 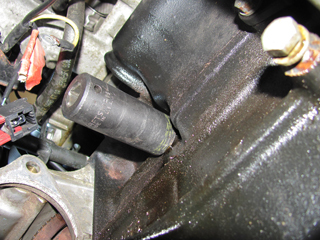 Now go under the car and remove the intake manifold support bar. The bottom screw only needs to be loosened to as the bar is notched. 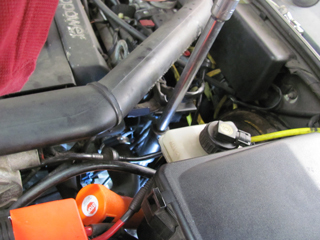 Now, remove the main power wire from the starter and alternator. 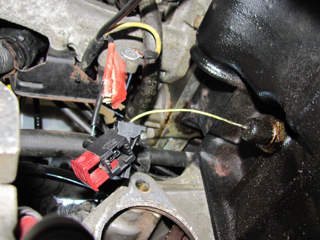 Also on the starter, find the second smaller wire next to the power wire and remove that as well. 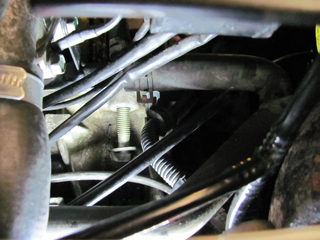 From above the car, there was a small 10mm bolt holding the power wire in place. I had to remove this in order to move the power wire out of the way and get access to the top starter bolt. There is also a plastic wire tie that needs to be removed. This holds the power wire and sensor wire in place. Note where it is located so you can replace it when the time comes! Now that the power wire is out of the way you can remove the top starter bolt. Access is tricky and I ended up using a small 3/8" pry bar with a handle extenstion to break the bolt loose. After that, I used a small, gearless ratchet to remove the bolt. It is a great tool for limited access spots, but is expensive! 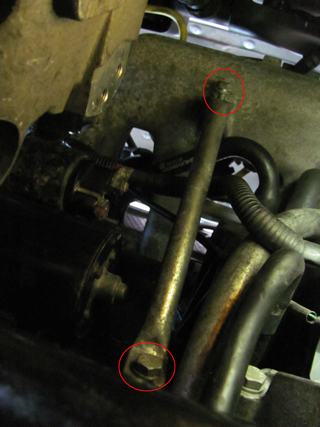 Once the top bolt is removed, go under the car and remove the bottom bolt. Access is straight forward. 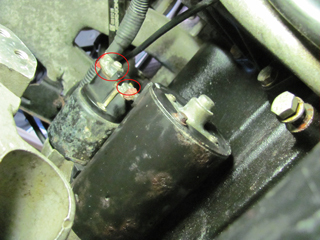 Once the bolts are removed the starter will still feel connected to the block. I ended up using a hammer and pry bar to knock the starter loose. I went from above and hit the top until it came loose. After that I went under the car and wiggled it out and onto the floor. From below the car you should be able to see the sensor. You need to use a small screwdriver to pull out the red part of the plug. Now clip off the wire and use a socket to remove the sensor.